I magine, with the click of a button, being able to transport yourself directly into the kitchen of a chef on the other side of the world. With Skype cooking classes from The Chef and The Dish, that’s closer to being a reality than ever before. The Chef & The Dish is a global kitchen to kitchen culinary experience. 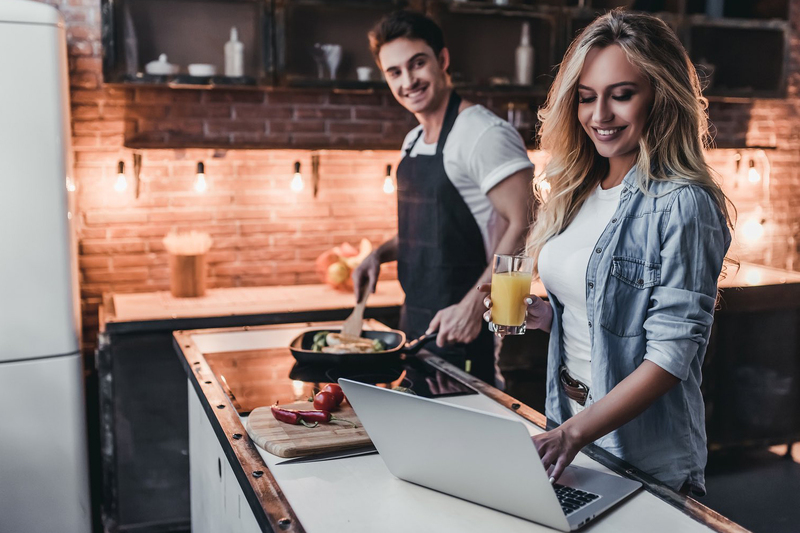 Students anywhere in the world connect in real time with chefs via Skype for private, live, one-on-one cooking classes in their own kitchens. Connect to a top chef around the globe to learn how to make the world’s most iconic dishes - all with the private coaching of a chef who lives where the recipes originated. Ask all the questions you want and get step-bystep coaching in a 2-1/2 hour private session - it’s just you and the chef. Once your class is done, you’ll have an amazing home-cooked meal - as authentic as if you transported your kitchen to another part of the world for the day. No flight required. Whether it’s Pasta-Making with a chef in Northern Italy, learning to master Cacio e Pepe with a chef in Rome, trying your hand at Gyoza with a chef from Tokyo, Jambalaya with a chef from New Orleans, learning Paella with a chef in Spain, or Satay with a two-star Michelin chef in Singapore - The Chef & The Dish offers tens of cooking classes (and even creates special classes!) to choose from and gift certificates for every occasion. Dinner parties will never be the same. New Orleans native Chef Gason is a two-time James Beard Scholar. Chef Gason’s extraordinary culinary skills have taken him around the world to cook for those with the most discriminating tastes including the Kardashians, Dwayne ‘The Rock’ Johnson, Matthew McConaughey, Swiss Beats, Sinbad, Jairus Byrd, Paul Walker, Reggie Bush, and New Orleans Saints’ tight end, Ben Watson. He’s been featured in Sports Illustrated, New Orleans Magazine, morning shows, and on the Food Network show, “Chopped”, making it all the way to the final round. His passion for food and his hometown comes out in the smallest details. As Chef Gason says, “The state of being full immersed into an activity is called ‘flow’. Flow is my culinary code.” And flow is what you’ll learn from hime, without a doubt. Known as the NOLA Chef, his private chef and catering company, Full of Flavor, caters to two or two hundred and comes with rave reviews. Now he’s ready for his next adventure - teaching you how to cook traditional New Orleans classics. During your cooking class, his energy and giant spirit will pop out of your computer screen, and by the end, you’ll have a new friend, and some of the very best Creole food you’ve ever tasted. He can’t wait to teach you how to cook New Orleans style during his classes with The Chef & The Dish. Chef Paul Then is one of Singapore’s most celebrated chefs. He’s best known for his Peranakan cuisine, a mix of Malay and Chinese influences. Paul was born in a Straits Chinese family where he began helping his grandmother cook at a young age. As an adult, he attended a prestigious French culinary school. Since then, he’s cooked all over the world. Paul was instrumental in receiving two Michelin stars during his time as Executive Chef at Cuisine Cuisine. He has more than 30 years experience working as Chef or as a Guest Chef in some of the top restaurants in the world from Singapore, China, Australia, France, India, Germany, Thailand, and Italy. He was a finalist at the World Gourmet Summit for the Singapore Executive Chef of the Year Award in 2014. He has appeared in many Singapore Television cooking series and TV shows and works actively with the Singapore Tourism Board. His line of Asian Sauces is available under the name of Baba Chef Paul. During your private cooking class with The Chef & The Dish, you’ll whip up amazing Singaporean dishes. If you don’t know what that means - it’s Chinese meets Malaysian meets Thai - and you’ll understand after your class why Singaporeans consider eating their national past-time.